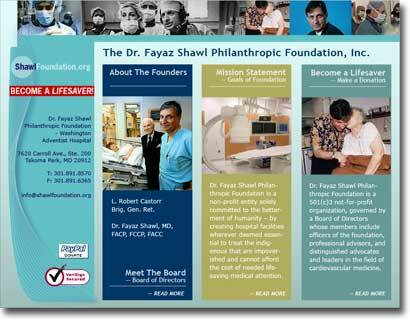 Dr. Fayaz Shawl Philanthropic Foundation Inc.
Website Graphics & Copywriting by Alev. Dr. Shawl is a world-renowned cardiologist who has performed over 19,000 successful Interventional Cardiac Procedures since 1988. The Dr. Fayaz Shawl Philanthropic Foundation, Inc. is dedicated to its mission of establishing specialty cardiac hospital facilities for the poor. ASJ Company has been working with Dr. Shawl since 2003. We have provided myriad services including: Web Design & Development, E-commerce, Video & Photography, Branding and Graphic Design. The Shawlfoundation.org project, shown above, consisted of a new GUI (Graphic User Interface), a website with E-commerce capability, web-copywriting, branding services, and support with Paypal in establishing nonprofit status.